Indeed, while majority rule might in fact be the best system, it can’t be denied that democracy, for all the happy results it has delivered, has also birthed some horrific offspring. It was a popular vote in 1932 that made the Nazis the largest party in the German parliament. And lesser evils have been offered up by majorities in many countries since. And even leaving aside that a body politic can include majorities with malevolent inclinations, the fact that money seems so crucial to political campaigns’ successes – that, in other words, enough partisan, prejudiced advertisements can effect victories – is itself a major chink in democracy’s noble armor. If large numbers of people are susceptible to the sort of inducements that convince people to buy a particular brand of perfume or beer, what does that say about the electorate’s intelligence? And then there is a particularly disturbing ailment that seems to have broadly infected political advertising, at least in these United States. The other flyer, from the fellow referred to in those all-caps, sports its own capitalized declaration, that a vote for his opponent “IS A VOTE AGAINST PRES. TRUMP” – a most awful insult in my Staten Island district. And, amid other opprobrium, that the other guy “CO-SPONSORED 2 LIBERAL AMNESTY BILLS.” For shame. We are greatly relieved that no Jew people were involved. Negative campaigning, of course, is nothing new. Although candidates didn’t do active campaigning in those days, during the lead-up to the 1800 presidential election, Thomas Jefferson’s camp accused President John Adams of having a “hideous… character, which has neither the force and firmness of a man, nor the gentleness and sensibility of a woman.” In return, Adams’ men called Vice President Jefferson “a mean-spirited, low-lived fellow, the son of a half-breed Indian squaw, sired by a Virginia mulatto father.” Adams was labeled a fool, a hypocrite, a criminal, and a tyrant, while Jefferson was branded a weakling, an atheist, a libertine, and a coward. 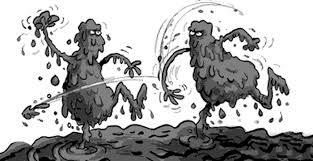 But, at least over more recent campaigns, mudslinging has been on the rise. In every presidential election cycle from 2000 to 2012, campaign advertising was for the most part more negative than in the previous one. As anyone involved in marketing or advertising knows, repeated exposure of a message leads people to accept it as fact. Whether or not it happens to be. Combine that with an actual fact, that most people know very little about politics – only about two thirds of people can name their state’s governor, about half know that there are two U.S. senators from their state, and less than half can name their congressional representative – and it’s not hard to imagine how democracy might yield disaster. I’m not advocating, any more than Churchill was, some other system of government. But each election year I wonder what would happen if candidates for office were limited in what their campaign literature and ads could say, if the only information permitted was about the merits of the candidate, not the failings of his or her opponent. Campaign seasons, in that fantasy world, would be more enlightening and less misleading. But they would also be less interesting, or, at least, less entertaining. Which is why that scenario isn’t likely to ever become reality. The electorate, I suspect, wouldn’t stand for it. This entry was posted in issues of morality or ethics, News on May 24, 2018 by Rabbi Avi Shafran.